An international research team, with participation from the Niels Bohr Institute at the University of Copenhagen, has found the same type of interstellar dust that we know from the Milky Way in a distant galaxy 11 billion light years from Earth. This type of dust has been found to be rare in other galaxies and the new discovery plays an important role in understanding what it takes for this particular type of interstellar dust to be formed. The carbonaceous dust is registered in the measurements as a "dust bump", that is, a high value of dust with the said composition. This ultraviolet dust bump has now been detected in a gamma-ray burst, which has been named GRB180325A and the result has just been accepted for publication in the journal Astrophysical Journal Letters. The lead author is Tayyaba Zafar who completed her Ph.D. studies at the Niels Bohr Institute in Copenhagen and is now working at the Angle Australian Observatory in Australia. Several other researchers from NBI are co-authors of the article. GRB180325A was detected by Neil Gehrel's Swift Observatory (NASA) on 28 March 2018. Swift is a satellite mission that detects gamma rays from the dying stars. When such a detection from the satellite hits the astronomers, a hectic period begins. The astronomers try to observe that part of the sky as quickly as possible in order to secure the crucial information that allows them to study the interior of the galaxy the explosion originated from. In this case Kasper Heintz, who did his master's thesis at the Niels Bohr Institute and is now a Ph.D. student at the University of Iceland, was on duty. He activated the Nordic Optical Telescope (NOT) at La Palma, where Professor Johan Fynbo from the Niels Bohr Institute was observing for another project. The first observations of the light from the gamma-ray burst were secured only a few minutes after the discovery by Swift. The observations from NOT showed that the star had exploded in a galaxy with a red shift of 2.25, which means that the light has travelled approximately 11 billion light years. The observations immediately showed that the dust bump, known from the Milky Way, was present in this galaxy. The team then observed the gamma-ray burst with the X-shooter spectrograph on ESO's Very Large Telescope (European Southern Observatory) on the Cerro Paranal in Chile. All in all, four spectra of the afterglow from the gamma-ray burst were secured – all with a clear detection of the dust bump. "It is a beautiful example of how observations in space and around the world can work together and create breakthroughs in research. The work also gives cause to express great thanks to the Carlsberg Foundation, without which Danish astronomy would neither have access to the Very Large Telescope nor NOT," says Professor Johan Fynbo. 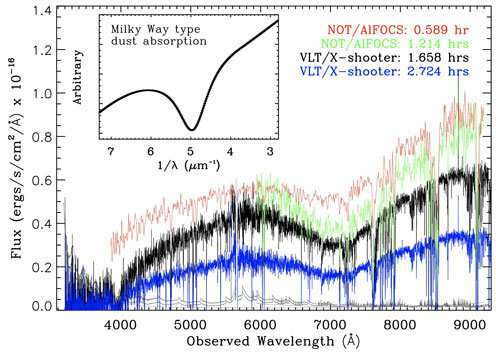 "Our spectra show that the presence of atomic carbon seems to be a requirement for the dust that causes the dust bump to be formed," says Kasper Heintz. "Further observations of this type will allow us to find more galaxies with this dust bump and thus conduct a more systematic study of similarities and differences in dust composition throughout the history of the Universe and in galaxies with different properties," says Dr. Tayyaba Zafar. "He activated (sic) the Nordic Optical Telescope at La Palma, where Professor Johan Fynbo was observing for another project." Well...was Dr. Fynbo ever able to complete his observations? Good question. Now I am concerned whether or not the dust that is laying atop my chifforobe is from another galaxy. 11 billion years ago the light traveled until it hit that telescope on Earth ???? And scientists have found out from the red shift and explosions of some air that there is a dust there, mainly composed of carbon. Were these scientists thinking about what the light was traveling for so long and how old that galaxy was when it existed and before light began to light away from it. ? How old is the universe and how big is it? This is evidence that these are just some secrets that are formed on the basis of the wrong and unnatural "laws and theories" invented by "great scholars" who, in general, do not understand the structure of the universe. ^^^^^And milnik demonstrates the proof that there are scientifically illiterate nutjobs out there who like to spam their idiocy all over the internet, but never actually contribute anything to the sum of human knowledge. ZB, you're logicalling backwards. If the Steady State nonsense was correct? LOL! The phenomena observed to date would also be occurring in our little corner of the SS Universe. That reality is lumpy and grumpy and fractured with inconsistent results, every where we look? Means that empirical observation is disagreeing with the antiquated model/simulation proposed by Hoyle. It is time to accept the verified and confirmed work he accomplished in the verified standards of early 20th Century astronomy. Trash the multitudes of speculations continuously proven incorrect, unverifiable, mistaken. Then move on. All scientists have a trash can of bad ideas and ridiculous notions Most succeed at avoiding becoming a cult. It is Hoyle's misfortune that the importune will continue to tarnish his honorable reputation. Using his own off-the-cuff hypothesis as a sacred weapon to attack scientific advances that violate the chiseled-in-stone SSU dogma.